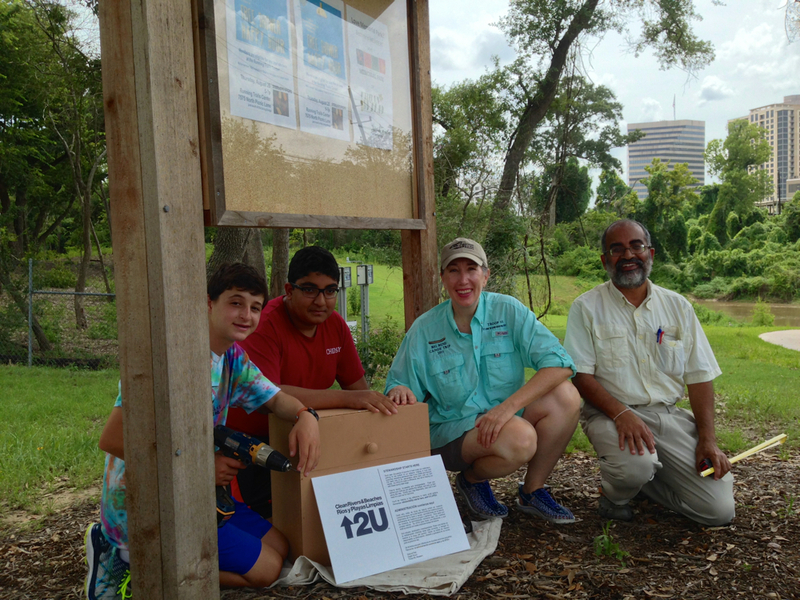 On a recent trip down Buffalo Bayou, pausing to document the springs seeping out of the banks, we stopped at one of our favorite spots: the wide sandy bank of what we call the middle meander — so named because it’s the middle meander in that 1.25-mile long stretch of the forested bayou targeted for destruction by the Harris County Flood Control District. This sharp bend in the river is located at the eastern boundary of Memorial Park, with a small tributary flowing into it and very old high banks on the downstream side. 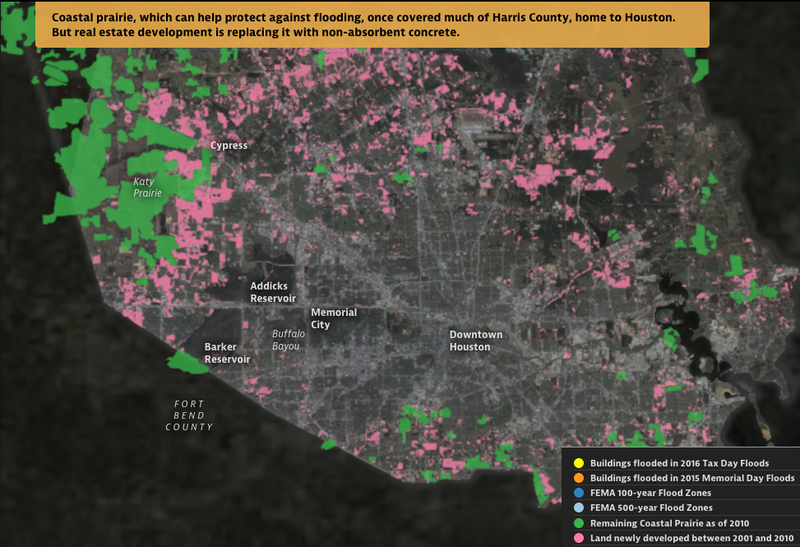 It is a natural stormwater detention area, and elsewhere the flood control district is spending millions to build detention basins in or near our bayous. 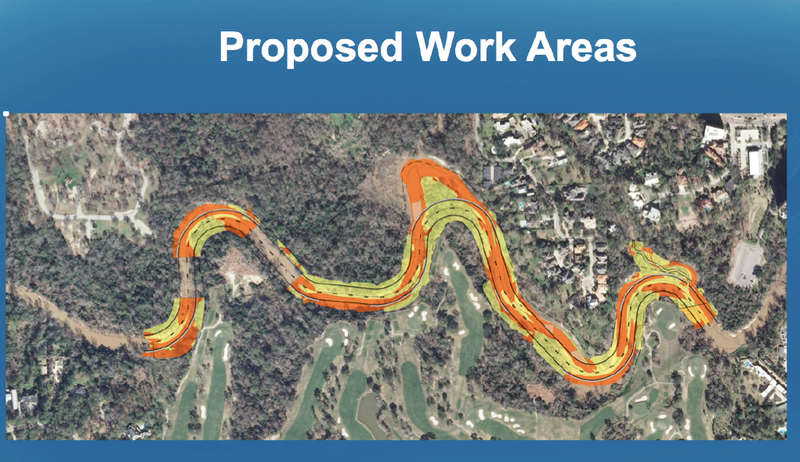 But here the district’s plan is to spend millions to fill in a detention area and dig a new channel for the bayou through the woods on the south bank of the bayou owned by the River Oaks Country Club. Why the members of the club would agree to that is a mystery. The plan also calls for grading the ancient high bank, leveling the area, and planting it all with turf grass. 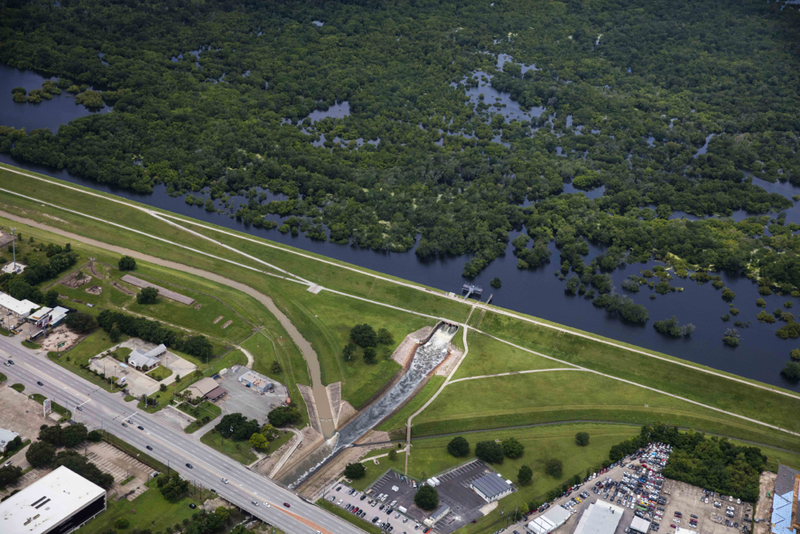 An access road for heavy construction equipment would be bulldozed through the public forest from the maintenance yard near Memorial Drive to the bayou. Unusually, in this meander, the bayou deposits sediment on the outside bend, the park side of the stream, causing the bank to widen. (Normally sediment is deposited on the inside bends and picked up on the outside.) But the high outside bluff here is composed in part of very hard, resistant clay. This reversed phenomenon might also in part be the result of the blocking flow of the tributary shooting across the channel during rain events. 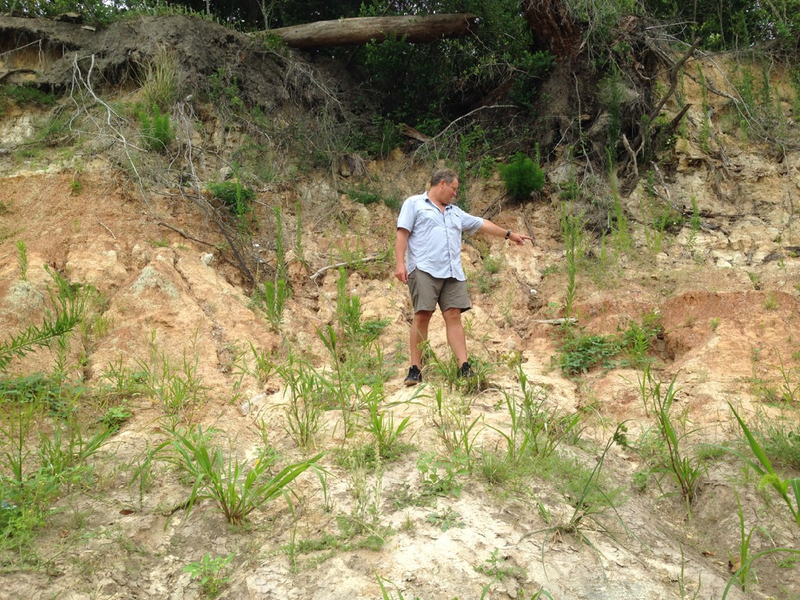 And Geologist Tom Helm thinks that a fault running through the meander might have caused the bayou channel to shift somewhat to the southeast over time. 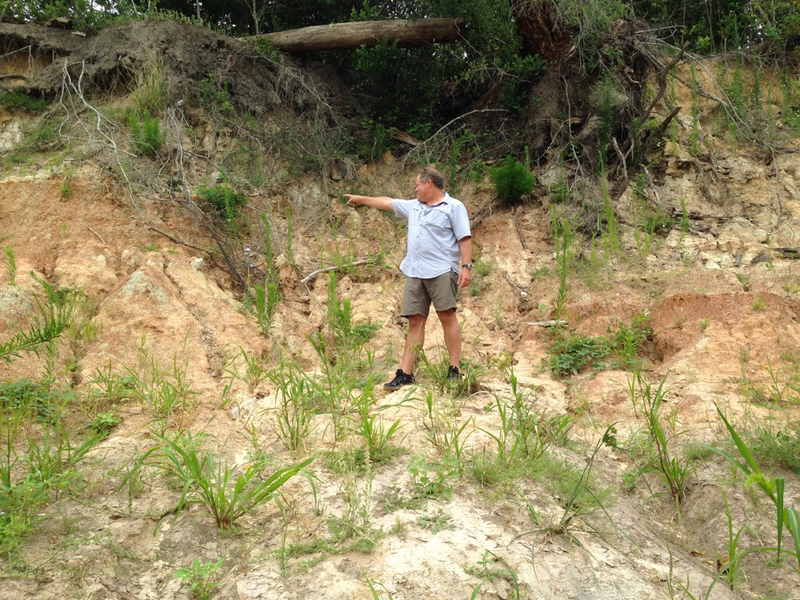 Here is a photo of Tom pointing to the downshifted layer of dark red clay in the strata of the face of the high bank, which is part of the tens-hundred-thousand years old late Pleistocene-era meander-belt ridges carved out of the earth at the end of the last glacial period, when giant sloths, zebra horses, and saber-toothed cats roamed through Memorial Park. We still have American alligators (alligator mississippiensis) and alligator gar from that period. The high cut banks of these meander-belt ridges are long-established characteristics of our west-to-east meandering streams in the Houston region and serve as as bumpers slowing the flow. The dark layer Tom is pointing to in the face of the high bank of the middle meander is offset by about three inches, possibly indicating a fault. Tom Helm pointing to his right. Invasive Johnson grass in foreground. When we stepped out of the canoe onto the sandy north bank of the meander, we were dismayed to discover invasive Johnson grass growing all over the beach. In the past this lovely sand bank was naturally landscaped with native smartweed, ground cherry and young box elder and black willow, all the proper native vegetation intelligently arranged by the bayou as it worked to stabilize the sediment and plan for new growth. But now this invader was taking over. We had seen it also at the boat launch in Memorial Park at Woodway. Very discouraging. Anyone who wishes to organize Johnson grass-pulling parties is encouraged to do so. 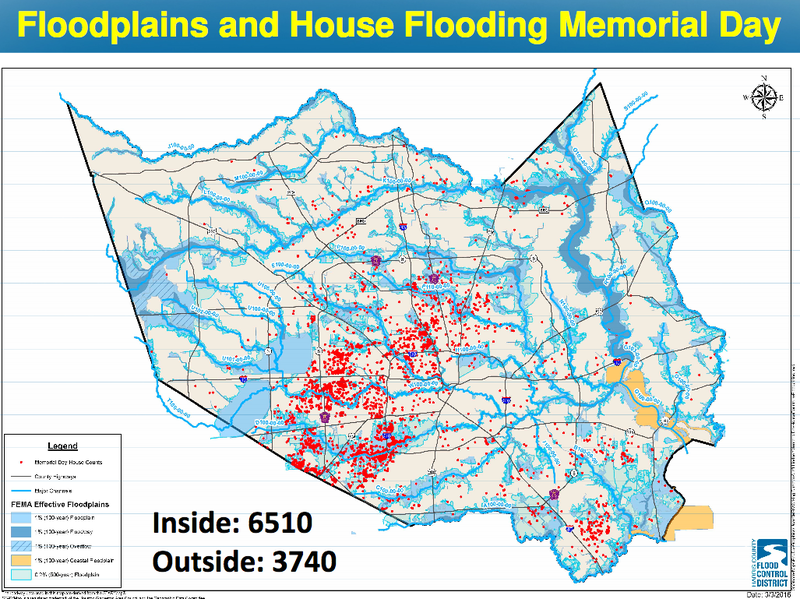 The Memorial Park Conservancy unfortunately does not consider maintaining the banks or bayou woods part of its job, instead largely confining routine maintenance activities to mowing down the sedges and other wetland plants in the bogs of the park, leaving behind large, deep ruts. How nice it would be if the Conservancy respected the natural character and landscaping of our park. As we inspected the springs that flowed out of the high bank, we were surprised to find a large pile of broken glass bottles and pottery embedded in the mud. The glass was thick and had an old-fashioned shape. The pieces looked very old. 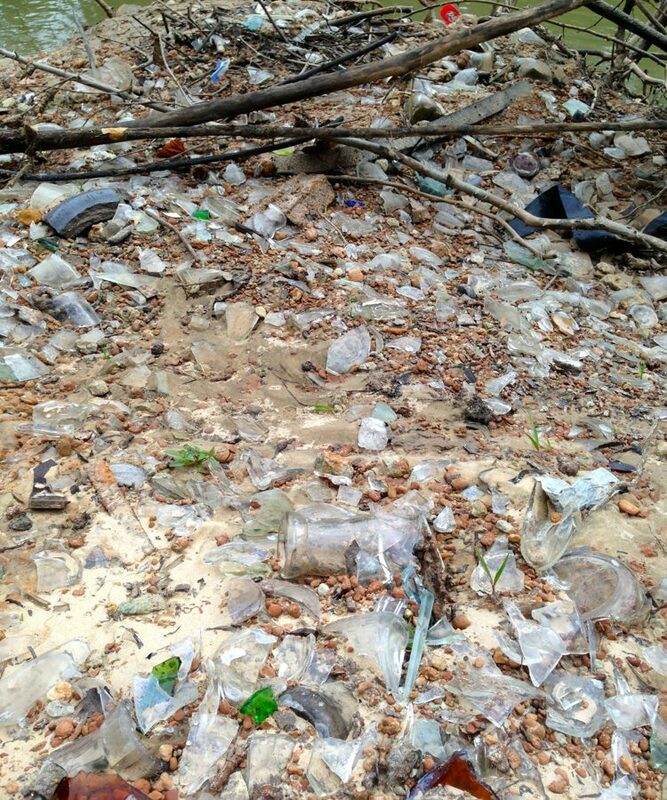 Geologist Bill Heins, who explores the banks of the bayou regularly with his dog, suggests that the bottles and pottery had washed out from an old trash dump in a filled gully higher up the bank. Very possibly the pottery and bottles date from the era of Camp Logan, a World War I military training camp established in 1917, part of which would become Memorial Park after the war. Beginning in August of 1917 there was a large military hospital, as well as a landfill, operating on the north bank of the bayou, eventually occupying over 100 acres of what is now the Hogg Bird Sanctuary and extending westward into what is now the park’s South Picnic Loop, according to Janet Wagner, landscape architect and historian and former chair of the Harris County Historical Society. In 2014 Wagner wrote to the Corps of Engineers about the archeological significance of the bayou in the proposed project area. The hospital, she noted, served some 1,500 men and continued caring for veterans after the war. In 1919 the hospital and buildings were transferred to the Public Health Service, with some of them leased to the newly formed City-County Hospital District. In 1921 the Veterans’ Bureau took over the hospital and two years later began evacuating the veterans to other facilities around the state. One year later, in 1924, Will and Mike Hogg and their real estate partner, Henry Stude, purchased the hospital grounds and then sold at cost a total of nearly 1,500 acres of what had been Camp Logan to the City of Houston for the creation of Memorial Park. In May of 2013 the Texas Historical Commission designated the former site of Camp Logan a State Archeological Landmark, now known as a State Antiquities Landmark. The designation requires that the landowner receive a permit from the historical commission before conducting any work on the site. 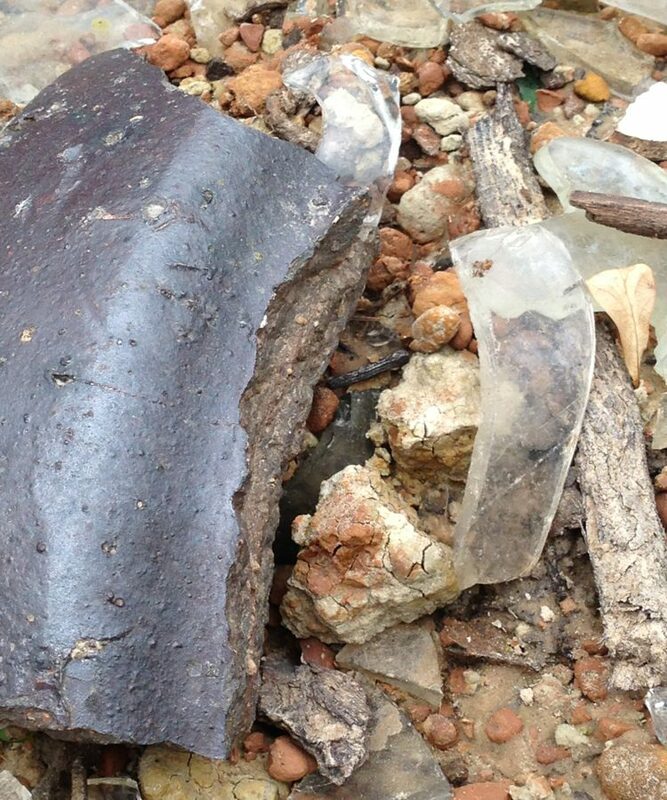 Here are photographs of the glass and pottery remnants we discovered on the bank of Buffalo Bayou in April 2017. 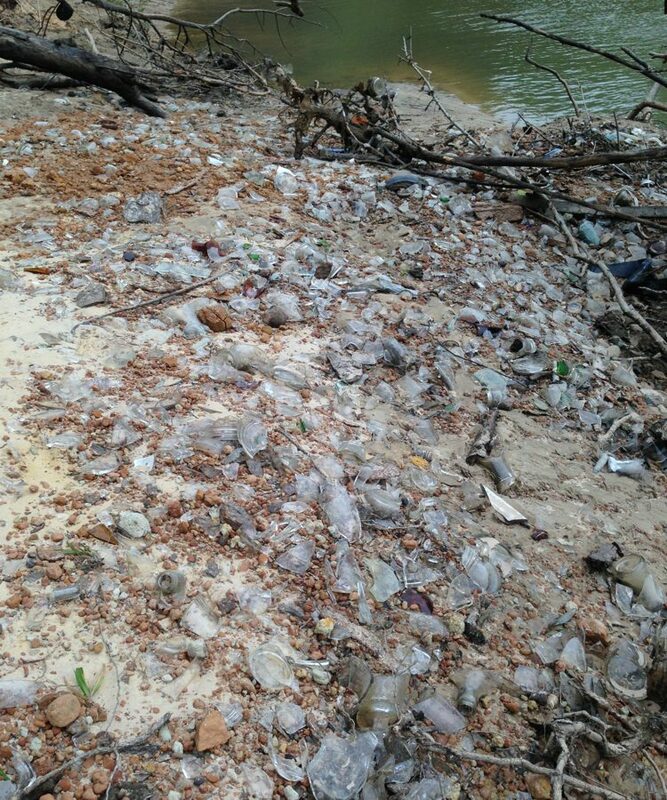 Very old broken bottles and pottery shards on a bank of Buffalo Bayou in April 2017. 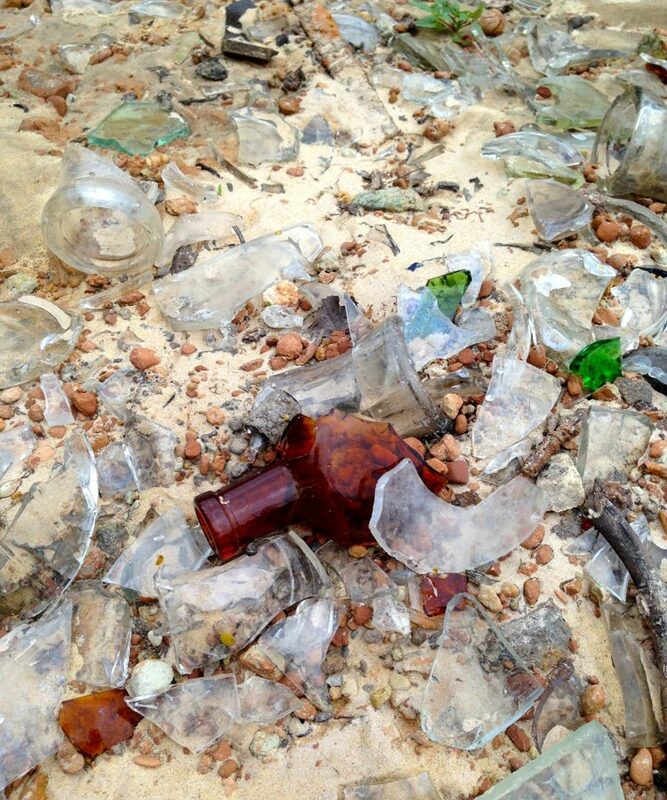 Closer view of old glass possibly washed out of a World War 1 military hospital trash dump in what was then Camp Logan. 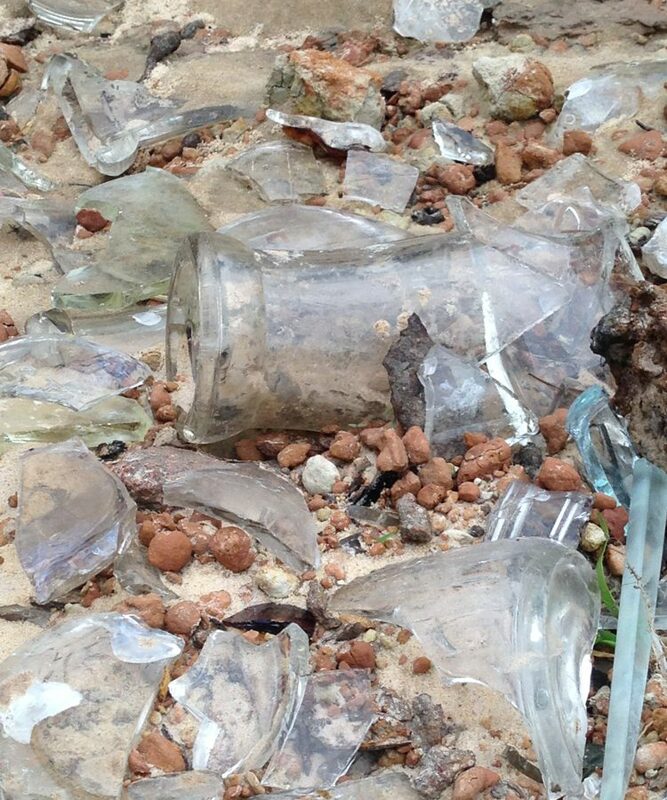 Close up of broken bottles. Close up of pottery piece.